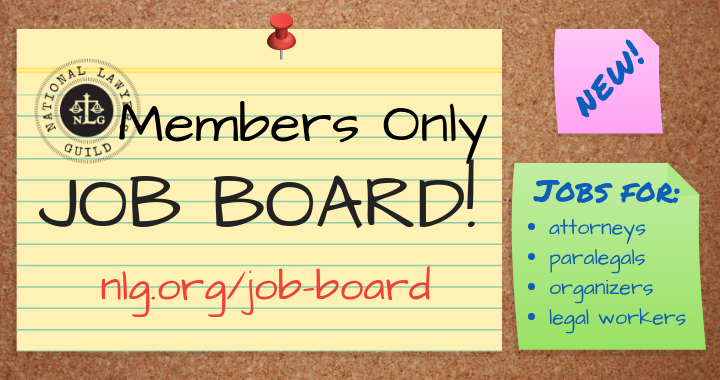 Announcing a new benefit of NLG membership: the members-only job board! Login to nlg.org with your credentials and go to nlg.org/job-board to view social justice-based job openings shared by NLG members for fellow attorneys, paralegals, organizers and legal workers. Do you know of a job opportunity that’d be of interest to Guild members? Send job postings to jobboard@nlg.org! Not an NLG member? Learn about all the benefits of membership and join us! Posted in Announcements and tagged Job Board.